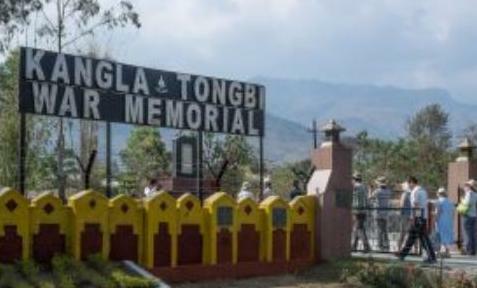 Kangla Tongbi War Memorial, (near Imphal) commemorated the Platinum Jubilee of the Battle of Kangla Tongbi War (7th April 2019) was commemorated by Army Ordnance Corps. The commemoration day was observed to honor the supreme sacrifice made by the courageous Ordnance Personnel of 221 Advance Ordnance Depot in the line of duty during the night of 6/ 7 April 1944 (during World War-II). After the wreath-laying ceremony by Lt Gen Dalip Singh, VSM, DGOS & Senior Colonel Commandant, senior dignitaries visited the Kangla Tongbi Children’s Home where the children were presented with gifts as a matter of charity. One of the fiercest battles of World War II, The Battle of Kangla Tongbi was fought by Ordnance personnel of 221 (AOD) Advance Ordnance Depot. The in-charge of the operations for the defense of the depot was Major Boyd, the Deputy Chief of Ordnance Officer (DCOO). A Suicide squad of personnel from the Depot was created. The squad comprised of Major Boyd, Havildar/ Clerk Store Basant Singh, Conductor Panken and other personnel. Major Boyd was awarded various recognitions, namely, the Military Cross (MC), Conductor Panken, the Military Medal (MM) and Hav/ Clerk Store Basant Singh, the Indian Distinguished Service Medal (IDSM). The Battle of Kohima often referred to as the “Stalingrad of the East” was fought in three stages from 3rd April 1944 to 22nd June 1944 during the Second World War. The Battle of Kohima is considered as the turning point of the Japanese U Go offensive, or Operation C mission launched in India in 1944.